A Russian Soviet Era Icebreaker, typical of the type. She was built for working in Arctic waters during winter around Siberia, in particular to help keep shipping lanes open for other shipping. The Kapitan Khlebnikov is one of four Kapitan Sorokin class diesel electric ice-breakers built in Helsinki by the Wartsila company. She was launched in 1980 and is designed to operate in temperatures down to -50Ã‚Â°C. Currently she is operated by a shipping company based in Vladivostok. The collapse of the Soviet Union meant that such assets as ice breakers could be chartered out for hard currency. In 1990 The Kapitan Khlebnikov was refitted for use as a tour ship in the Arctic and Antarctic. She now has the fittings and facilities that would be expected of a ship fulfilling that role. She can berth 114 passengers looked after by 60 officers and crew. Main engines: 6 diesel sets producing 24,200 horsepower (18.5MW) driving 6 electric generators. Drive system: 3 twin DC electric motors each turning a 22m long propeller shaft to which is attached a 4 bladed 4.3m diameter propeller with hardened steel blades. Blades can be changed at sea in the event of damage. The ship can be operated from two positions, the main bridge and also an auxiliary bridge towards the back of the ship if ice is being broken when going backwards. Friction between the ship and the ice is reduced by a polymer-paint coating at the level of the ice skirt. Double hull with water ballast between, pumps can move up to 74 tonnes of ballast water a minute to aid ice breaking. Two helicopters are carried to help with navigation in ice and for tourist trips. The stern region is cushioned to allow for the close towing of other vessels when helping them through the ice. Maximum speed: 19knots (35.2kmh), cruising speed 16 knots (30kmh) in calm open water. Ice 1.5m thick can be broken at 1 knot (1.8kmh). Ice of 3m has been broken by repeated ramming. Powerful lights are carried for operations in the dark of winter. Air bubbling system to help ice breaking. Air can be forced under pressure from 2m above the keel from the bow to half way down the ship. 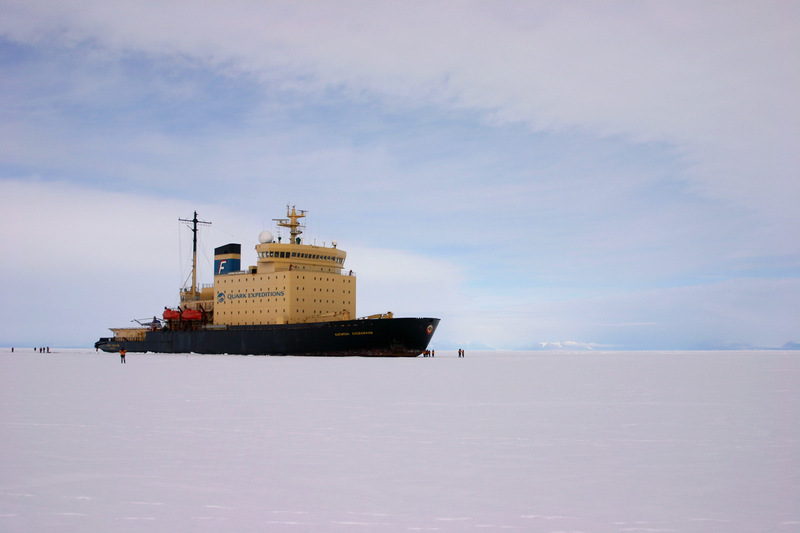 Being an ice breaker, the Kapitan Khlebnikov can visit places that other tour ships dare not go. Most tour ships play it very safe with ice around and will not approach or enter an area where the changing tide and wind could entrap the ship. This ship however can go where ordinary tour ships have previously feared to tread. Cold mountain Thomas Keneally travels on the Kapitan Khlebnikov to return a biscuit. "I first went to Antarctica in 1968, for somewhat under a fortnight. In those days one could visit the continent only as a member of an official group, and the American ambassador in Canberra, Bill Crook, a noble soul who would later give his life to a di..."